← March comes in – sunny! A few words to report what has been happening since the beginning of this year. I suspect that visitors to the site are now as few and as intermittent as my posts on to it. But the house is built and we’re living in it, so the excitement when everything was new and slightly experimental has, er, abated. We finally got the Solar PV more or less sorted. As described earlier, there are two “strings” of 9 panels side by side on the same roof. So you would expect the output from each string as shown on the inverter display to be the same to within quite tight limits when the system is new – which they were – and to change only gradually as the panels age. It was noted that, within a year, the output from the east string was 10% below the west string. 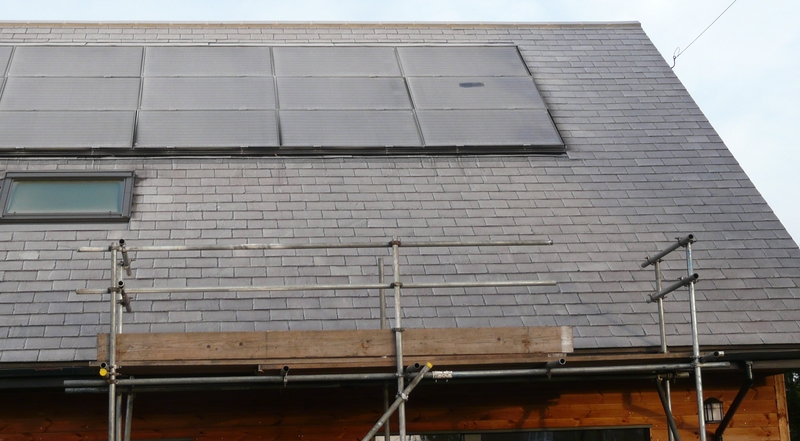 This was reported to the contractor that installed the PV system. The measurements were confirmed but nothing was done to rectify the matter. By the following spring the east string had deteriorated to the point that it was 17% below the west string. I pointed out that this was well outside the guaranteed performance – no more than 10% degradation after 10 years, no more than 20% degradation after 20 years. More measurements of the open-circuit voltages and short-circuit currents from each string were made and, after I pointed out that I would have to consider my legal position, there was even a visit from the panel manufacturers, Romag. Romag had hoped that using a thermal camera would identify any suspicious temperature differences in the panels but this didn’t seem to work. In the discussions it was put to me that the energy that the system had collected over the previous year was still significantly greater than the SAP performance. I was unimpressed by this, pointing out that the SAP figure must be one which even the worst system in a year of really bad weather would be able to exceed, otherwise the industry would be receiving continuous complaints; they had to admit that this was the case. In other words the SAP performance is a worst case figure! But this was a red herring – the outputs were substantially different so the east string must be defective. Eventually coordinating some roofers and the independent contractor was achieved and the defective panel was replaced. There was a period of panic when it was found that the first panel on the stack of replacement panels was found to be a slightly different size and wouldn’t fit. Fortunately the next panel was the right size! With the benefit of hindsight I should have insisted that all the panels were checked and had all those that were “down” replaced. While I’m certain that the panel with the hot spot was the main culprit – there were some scorch marks and evidence of some delamination nevertheless the east string is still 9% below the west string. After a further struggle, the original installer reimbursed me for the independent contractor’s invoice. There’s further comment to all this: had I not had two strings – and so was able to compare the outputs – but only one, I would have had no idea that the performance had deteriorated. The normal householder, like me, does not have a light meter and other equipment to check how well the panels that have been supplied are performing. Worth a thought! This entry was posted in Solar PV, Uncategorized. Bookmark the permalink.